Also serving communities of Rogue River. The average cost of assisted living in Grants Pass is $3,795 per month. This is higher than the national median of $3,346. Cheaper nearby regions include Medford with an average starting cost of $3,330. To help you with your search, browse the 34 reviews below for assisted living facilities in Grants Pass. On average, consumers rate assisted living in Grants Pass 4.1 out of 5 stars. Better rated regions include Medford with an average rating of 4.2 out of 5 stars. Caring.com has helped thousands of families find high-quality senior care. To speak with one of our Family Advisors about assisted living options and costs in Grants Pass, call (855) 863-8283. Grants Pass, located in the southwest corner of Oregon, boasts the motto "It's the climate," so it's not surprising that weather is a real draw for seniors choosing to live here. Seniors can choose from nine assisted living facilities in Grants Pass, with another eight available in nearby communities. All of these assisted living communities provide room and board in a safe, residential environment. They also offer personal care services that include medication management and help with daily living activities, such as dressing, grooming and eating. 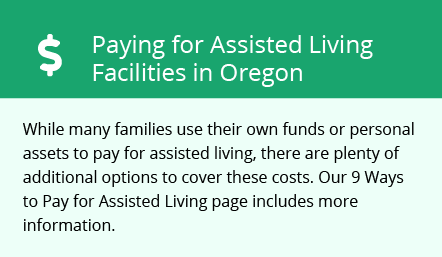 In Oregon, all assisted living facilities are licensed by the state's Department of Human Services. Summers are warm and even hot, with average high temperatures in the high 80s. Winters are mild, with low temperatures rarely dropping below freezing and highs in the mid-40s. Grants Pass receives less rain than most of the rest of Oregon, most of it falling during the winter. Seniors can revisit their glory days at the Back to the '50s celebration held in Grants Pass each year, featuring concerts and a classic car show. First Friday Art Nights draw people downtown every month to enjoy art exhibits and special events in the shopping district. Grants Pass has an array of community resources for seniors, including the Aging and Disability Resource Connection, an organization that connects seniors to transportation and Meals on Wheels, as well as one senior center. The cost of living in Grants Pass is only 6.9 percent higher than the national average, putting it within reach for many seniors on a fixed income. Josephine County Transit runs buses through the Grants Pass area during daytime hours on weekdays, and the Rogue Valley Transit District connects Grants Pass to Medford as well. Seniors are eligible to apply for a reduced fare bus pass, and paratransit Dial-a-Ride service is available for people with physical disabilities. The Grants Pass area is home to world-class medical facilities, including Asante Three Rivers Medical Center, in the event of medical emergencies or illness. Assisted Living costs in Grants Pass start around $3,795 per month on average, while the nationwide average cost of assisted living is $4,000 per month, according to the latest figures from Genworth’s Cost of Care Survey. It’s important to note that assisted living rates in Grants Pass and the surrounding suburbs can vary widely based on factors such as location, the level of care needed, apartment size and the types of amenities offered at each community. Oregon is one of just five states that offers a 1915(k) plan through its state version of Medicaid. This plan, also known as the Community First Choice plan, the K Option, or the K Plan, provides financial assistance to eligible seniors who need some help paying for their assisted living costs. Grants Pass and the surrounding area are home to numerous government agencies and non-profit organizations offering help for seniors searching for or currently residing in an assisted living community. These organizations can also provide assistance in a number of other eldercare services such as geriatric care management, elder law advice, estate planning, finding home care and health and wellness programs. To see a list of free assisted living resources in Grants Pass, please visit our Assisted Living in Oregon page. Grants Pass-area assisted living communities must adhere to the comprehensive set of state laws and regulations that all assisted living communities in Oregon are required to follow. Visit our Assisted Living in Oregon page for more information about these laws.